India’s growth depends on its ability to revamp its poor education sector, which suffers from problems of outreach and quality. Improvements in India’s education sector will require sustainable investments in a vast network of private schools and a standardized quality of education at an affordable price for the low-income, mass-market customer. Investments in the form of financial resources, organizational support, and value-added services can help these schools become efficient and effective educational institutions. Our first visit to a government school in India, in the southeastern metropolis of Hyderabad—the building was freshly painted. At 1:00 pm, it was already deserted. Classes were either empty or had a few girls. The boys were wandering outside. They had had their fill of the free mid-day meal and did not see a reason why they should sit around in classrooms waiting for their teachers to show up. The only teachers who seemed to be teaching were the “Vidya volunteers” (para teachers) who earn the equivalent of $25 a month and are only temporarily employed. The government instructors earning salaries of $300 were either absent or had left early to teach private lessons, albeit illegally. And yet, thanks to a powerful teachers’ union, no instructor would ever have to worry about losing his or her job. Of the 18 toilets in the school, 17 were locked, and the only open toilet was filthy. The school had an air-conditioned computer room with several brand new machines and a state-of-the-art projector, barely used—yet there was no computer teacher. The school building had a shiny new gate that kept the children locked until 12:30 pm, at which point the free mid-day meal was served. Asked why classes were empty, the principal quipped, “The school needs a compound wall to prevent the children from escaping!” In a subsequent visit to the principal’s office, we noticed a graph on the wall announcing the fact that 83% of his students had failed the Class X state board exam required to gain admission into college. Compare this school with one in which students are provided a standardized quality of education at an affordable price of $3 per month. Teachers are punctual and held accountable for their performance. Effective teaching methodologies help bring back the joy of learning. Enrollment figures are high and absence rates are negligible. Scholarships are available for poor, but deserving students. The education is relevant; skills required for success in higher education and competition in the booming Indian economy form an integral part of the curriculum. Microfinanciers and educational ventures make sustainable investments in a collection of educational institutions. Private entrepreneurs monitor conditions intently, incentivized to deliver high-quality education in return for attractive financial and social dividends. Utopian though this vision may be, Indian entrepreneurs can collaborate with social investors to build networks of private schools that will deliver a high standardized quality of education to students from low-income families. According to a Goldman Sachs report Dreaming with BRICs (Brazil, Russia, India, and China), India could be one of the world’s most dominant economies by 2050. The soaring Indian stock market has demonstrated an extraordinary level of confidence in the country’s potential. India’s population of 1.1 billion—having often been considered a liability—is now being redefined as its “demographic dividend.” Behind the gloss of the predictions is an open caveat: Much of India’s growth depends on its ability to bring substantial improvement to its dismal education sector. India’s educational system suffers from the basic problems of “outreach” and “quality.” Millions of children are out of school, and learning outcomes are alarmingly poor. 75% of all children attend government schools. Unfortunately, however, these schools are failing millions of children. According to the World Bank, a quarter of government school teachers are absent on any given day, with no more than half of those present actually teaching; India has the second-highest rate of teacher absenteeism in the world. High levels of teacher absence and turnover have crippled the educational system. According to a study by the MIT Poverty Action Lab, in the Indian financial capital of Mumbai, 25% of all students in Classes III and IV are illiterate, and 35% of students cannot identify basic numbers. Frustrated by the inefficiencies of government schools, millions of poor parents are voting with their feet by pulling their children out of the free, yet abysmal, public system. They are increasingly sending them to private schools run by young edupreneurs who charge a nominal monthly fee. According to a study by Rukmini Banerji, head of a non-profit educational organization in India called Pratham, only 17% of Mumbai’s children of proper age attend primary schools. 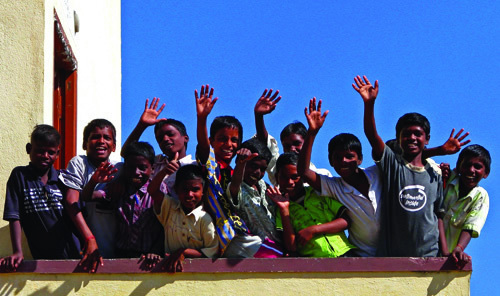 According to James Tooley and Pauline Dixon, two experts on private education in developing countries, Hyderabad hosts an equivalent number of students in private schools and government schools. Private schools in the Indian context are a far cry from Western private schools that cater to the wealthy—in India, they serve children from all socioeconomic segments. In recent years, thousands of schools run by enterprising edupreneurs have taken root in urban slums, small towns, factory settlements, and the by-lanes of suburbs that are inhabited by low- and middle-income Indians. Parents believe in the transformative power of education for their children and are willing to pay a price. While government schools usually teach in local regional languages, most private schools promise an “English” education and guarantee satisfaction. However, these promises often remain unfulfilled. A large fraction of these schools remain unrecognized by educational authorities—although they can enroll and educate students, graduates must pay an additional fee for a seat at government exams. Moreover, most unrecognized schools lack adequate infrastructure and suffer from high rates of teacher turnover. Teachers at these schools are often untrained and unqualified to teach. Parents of enrolled children are usually illiterate and belong to poor communities. Unable to distinguish between good and bad schools, or afraid to hold school owners accountable for their mistakes, these parents remain wishful for an alternative. Nevertheless, several private schools have demonstrated remarkable results. Run by young, enterprising, innovative community members, these institutions are committed to delivering quality education despite a myriad of challenges. Edupreneurs have attempted to fill the void in areas where government schools are either missing or ineffective. They have successfully convinced local parents that their children will receive personalized attention and a competitive education. The edupreneurs have kept their promises by attracting talented teachers from within the community, implementing effective teaching methodologies, and extending school hours to ensure that children are able to study without the pressures of child labor and unsupportive family environments. By offering scholarships to deserving students (particularly girls and orphans), these school founders have mobilized community members to support educational causes. During our visit to Hyderabad, we met an edupreneur named Anwar. Having founded a school in a local slum a few years ago, he now runs four schools. He is currently constructing a junior college for girls and is seeking a loan to start another college. At the entrance to Anwar’s school is a huge banner with pictures of students who have received merit ranks—a brilliant strategy that recognizes the success of his students and advertises the school to parents who are choosing between 15 other neighborhood private schools. Anwar stands in front of the banner each morning for two hours, talking to parents concerned about their children’s progress. He addresses inquiries on subjects ranging from school fees to complaints about the neighborhood bully. He is extremely responsive to parents’ needs—the students’ report cards have graphs depicting their performance and pictorial depictions that help illiterate parents monitor their children’s progress. To address the concerns of teacher absenteeism, Anwar is now installing closed-circuit cameras in all of his classrooms. His students have made him proud. Classes are packed with neatly dressed, disciplined, eager students who want to become doctors, engineers, teachers, and academics. These are children of mechanics, day laborers, farmers, and truck drivers. Parents pay all but two to five dollars per month. Despite these successes, the efforts of edupreneurs like Anwar are fragmented. They find themselves in a constant struggle with public bureaucrats to obtain legal recognition as they compete with highly subsidized government services. With no collateral to offer banks, cash and resources are scarce; microfinance institutions are reluctant to offer the amount of capital that they need. Moreover, a significant fraction of participating parents are poor—making fee defaults quite common. Edupreneurs are thus forced to rely on lenders for the payment of day-to-day expenses and instructor salaries. These institutions are difficult to sustain. Private Schools Owned and Operated by the Poor: The delivery of sustainable and profitable local education services will depend on the empowerment of community members who wish to open and run private schools. The power of grassroots entrepreneurship is on ample display among the thousands of existing private school owners like Anwar. If these edupreneurs are provided with necessary resources and support structures, they will continue to thrive and revolutionize the educational system. Kenya’s Sustainable Health Foundation has attempted to develop a similar model in the country’s healthcare sector, where nurses and other healthcare workers have opened a series of franchise pharmacies that aim to provide safe and affordable drugs to low-income communities. Local Entity, National Identity: Although they will be integrated under a common brand, portfolio schools will have to be adapted to meet local requirements. Parents are known for peculiar needs throughout various sections of the country. A catered local approach will ensure that all stakeholders are satisfied. Industrial Strength Standardization: Starting a school in India is an arduous task. The school owner must spend several years addressing government mandates, then struggle to find teachers, procure materials, and build a sustainable institution. Resources from a consolidated private school network can dramatically expedite the start-up process; consider for instance, a sort of plug-and-play model that comes with all of the materials that are required to start and run a school—for example, government paperwork, training material for teachers, standardized curricula, and more. Best-of-Breed: Rather than reinvent the wheel, the network should assemble the best elements of proven educational and operational models. Economies of Scale: The network can leverage its size to secure bargain prices on all resources. • Low-income parents in India have demonstrated a strong willingness to pay higher fees for sound educational opportunities. School branding can help parents make informed decisions as they distinguish between schools of various quality. • As part of a larger network, constituent schools will be held accountable for performance and transparency, updating parents continuously about their children and their studies. • A branding system will allow school founders the opportunity to distinguish themselves from mediocre schools and establish a set of performance benchmarks. • Constituent schools can earn the option to increase their enrollment fees with significant improvements in their performance. • Schools will have access to funding at reasonable terms. • Access to value-added educational services such as teacher training, educational software, product collaborations with local brands, and standardized tests will ensure that all students are measured on the same scale and receive a uniform education. • With the provision of management and operational support to schools, the network can employ best practices and innovative teaching methodologies to maximize efficiency and impact. Legal Approvals: Regulatory requirements vary across states and often constitute a primary source of concern for edupreneurs. To obtain legal approval for their activities, most are often forced to pay bribes. In light of these challenges, the private school network must be prepared for the demands of an intransigent and unpredictable governmental system. A strong set of regulatory compliance processes must be in order for all schools. Reliable Process for Selecting Edupreneurs: Individual edupreneurs will form the backbone of the school network. While consistent performance metrics are vital, network managers must identify edupreneurs who are both proficient in their work and capable of driving change under adverse circumstances. Commitment to education, acumen in business, creativity, ingenuity, and honesty constitute the most valuable skill set. Investment Strategy: Making judicious investments is a balancing act. The network will need to establish a rigorous investment process that takes into account the disparate financial needs of various schools. Partnerships with banks and other financial institutions will be critical to ensuring the right mix of loans, guarantees, and equity financing. Scalable Investment Model: The network must create a sustainable, scalable, and portable investment model. A good model for investing in private schools will encompass a variety of elements, including franchisee fees, default strategies, and revenue collection cycles. Communications Strategy: Given mainstream perceptions in India that education is a public good that should be free of cost, the network must devise a well-equipped communications campaign. To manage the challenges of edupreneurs as they struggle to ensure order in their schools, the franchise must put support services and public relations resources at their disposal. With an effective communication mechanism, school founders can keep parents well-informed about school performance. Accountable Governance Structure: As a consolidated organization, the network can help to hold constituent schools accountable with metrics for impact, financial returns, and reach. Developing a governance structure will require the combination of formal compliance processes that are common among investment funds and informal checks and balances that are common to grassroots organizations. Strategy for Fostering Innovation: The network will need to encourage innovation in teaching methodologies, learning techniques, and school governance among its edupreneurs to ensure that the curricula have a marked effect on student trajectories. Equity for Edupreneurs: To align the incentives of all stakeholders, edupreneurs must be made equity holders in the enterprise. Education is the widely acknowledged first step to development. Private schools offer an alternate system of education that can empower the poor through greater choice and access. The challenge is to innovate and reestablish a sense of confidence in the quality of education as a public good. A consolidated franchise of private schools can provide a powerful catalyst. Ayan Sarkar, Nitin Rao, and Prtya Naik are Managers at the Spark Group, an ideas incubator aimed at developing commercially viable business ventures that deliver services to poor communities. Photo by McKay Savage, used under Creative Commons License. Photo by Tom Maisey, used under Creative Commons License.